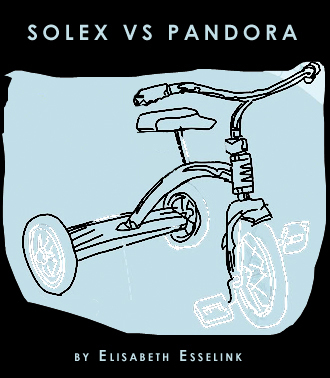 Dutch musician Solex a.k.a Elisabeth Esselink reviews her own Pandora radio station. Solex’s sample-based albums are not to be missed. Low Kick, Hard Bop is filled with thwarted, fractured jazz, while on The Laughingstock of Indie Rock she samples and duets with recordings of a man she’d never met who sent her his accapella rendition of the entire White Album. Esselink is also a former record store owner, which made her seem an ideal person to evaluate Pandora — a company that, after years of losing money hand over fist, has recently become one of the few entities in the music industry to turn a profit. Solex also has a new album out – Amsterdam Throwdown, King Street Showdown, a collaboration with Jon Spencer of the Blues Explosion and Christina Martinez of Boss Hog, featuring this stylin’ video.